I am a fan of paint conditioners, and have been using them to aid paint flow, level surface and provide an additive to both oil based and water based paints for many years. For oil based paints I use Owatrol Oil, a wonderful product that extends the “temperature window” of paint, which allows me to work for a longer season with exterior projects. Similarly, I use Floetrol for water based paints, this primarily makes the water based paint act as an oil based would; the leading edge stays open for longer and allows me to “work” the paint for longer and helps to eliminate brush drag. By chance I read an article written by Traditional Painter Member – Ron Taylor rjtaylordecoration.co.uk Ron is a specialist water based paint painter. 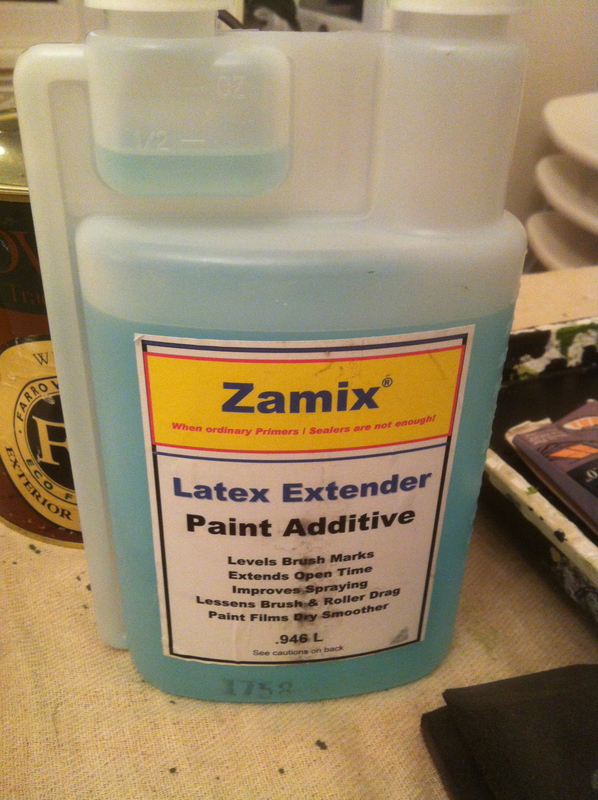 He recommends using Zamix Latex Extender paint conditioner with all water based paints. I contacted Ron today, we met and I obtained a 1 litre bottle of Zamix from him to test with Farrow & Ball Exterior Undercoat & Primer. 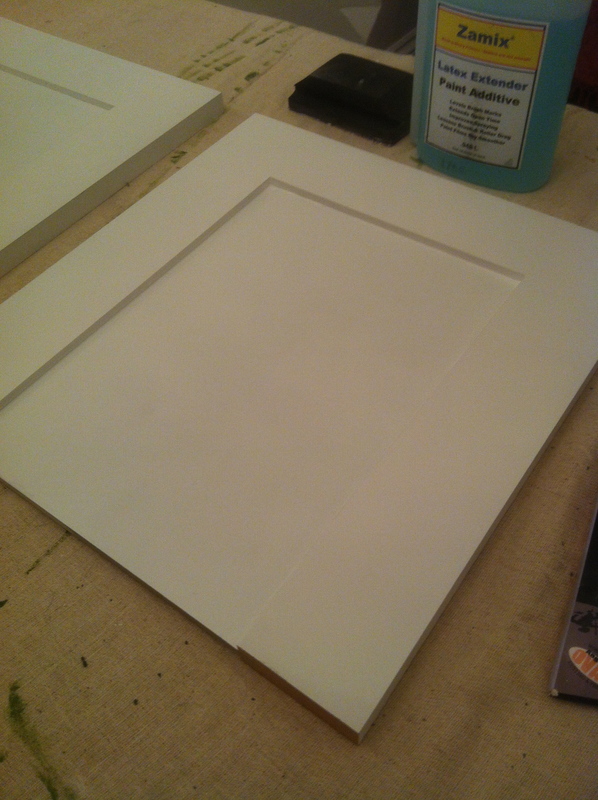 I tested the Zamix on a scrap MDF door previously primed with Zinsser BIN. The surface was sanded with Mirka Abranet 320 and cleaned off with Krud Kutter degreaser. I applied the paint containing a splash of Zamix with a Proform Picasso brush and a Dulux Microfibre Glosser roller. The Zamix is a different consistency to the Floetrol, the latter being more like PVA , the former being a solution. The Zamix is precisely dispensed from a measured chamber in the bottle. Initial observations; Zamix seems to mix into the paint evenly and eases application considerably, the paint stays open, but did appear a little “thin”, (this was probably due to my measurement rather than the product though). The brush moved easily with the paint and I was able to revisit the same area to work without dragging. Once dry, the surface was flat and most importantly; there were no marks. Although this was only a very limited initial test, it all bodes well for future usage. I look forward to working with Zamix in a live test situation in the future. I would also like to thank Ron for his invaluable advice, so freely given – a true professional and a valued Traditional Painter colleague. This entry was posted in Uncategorized on November 6, 2012 by mjguestltdblog. Looks like another reliable product for the painting armoury. Ron seems to have dug a small tunnel under the ocean to North America and come back with some great finds. There was more that I spyed in the back of his van… I’m sure that given time, I will be able to pry them from his mitts!! !